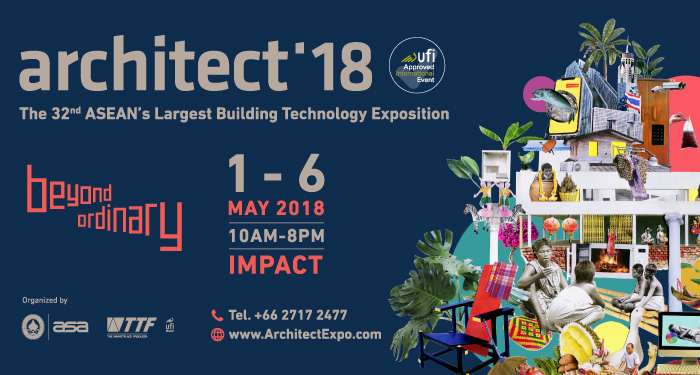 The concept of this year is Vernacular Living under the under the name “Beyond Ordinary” which highlights the importance of architectural innovations and design of modern lifestyle areas of Thailand. The exposition offers discussion in the topics of architectural origination which reflects knowledge in the unique and cultural heritage that redefines and reevaluates local modern architecture as a part of everyday living. This includes the constant adaptation and change in various aspects i.e. Globalization, climate change, and change in social structure. 1) “Modern local architecture exhibition” focuses on survey through daily activities in four areas: living area, business area, public area (and social area), and logistics area. 2) “Pavilion design” consisted of main materials subjects such as soil, brick, bamboo, and wood as well as the subject of construction and materials exhibition i.e. simple and complex materials use and construction.